Pick this Distinctive Endearment Assemblage as a souvenir of your feeling-nourished greetings for your beloved and deepen your mark in the individual�s heart. This is a day-winning Assortment of UAE Delights Chocolate Date Almonds (1 Packet), White Rabbit Creamy Candy (1 Packet), Kinder Joy (3 Pcs. 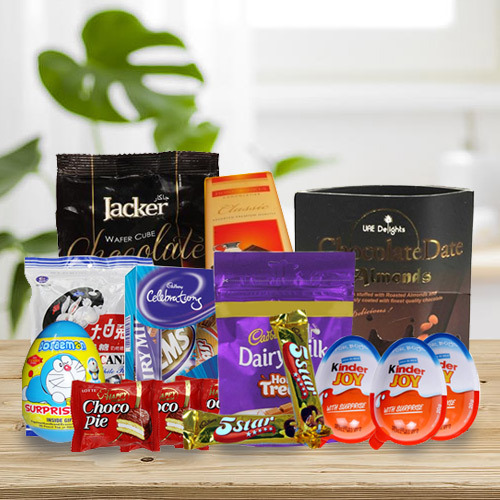 ), Cadbury Dairy Milk Home Treats (1 Packet), 2 Small Bars of Cadbury Five Star, 3 Small Packs of Chocopie, Honey Dukes Classic Chocolates (1 Bar), Jacker Wafer Cube Chocolates (1 Packet), Cadbury Celebration (Mini) and 1 Surprise Box of Small Toys.